Texas voters are feeling better about the direction of the country than they were a year ago, according to the latest University of Texas/Texas Tribune Poll. This month, 41 percent said the country is going in the right direction and 47 percent said it’s on the wrong track. They were more pessimistic a year ago, when only 34 percent said things were moving in the right way and 54 percent — a majority — said the country was on the wrong track. With Republicans in control of the White House and of Congress, 73 percent of GOP registered voters in Texas said the country is on the right track; but 82 percent of Democrats said it’s on the wrong track, pulling the overall numbers down. Among independent voters, 37 percent said the U.S. is on the right track, while 45 percent said it’s not. 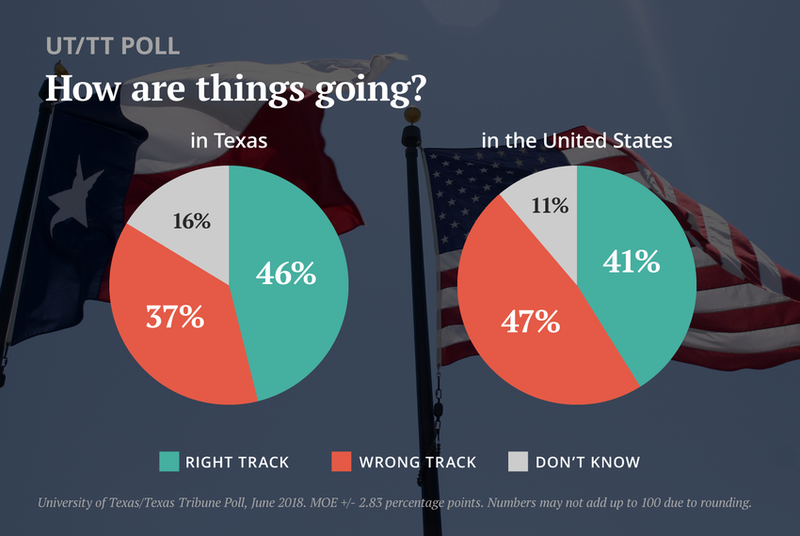 When it comes to things in Texas, voters’ opinions are about where they were last year, with slight improvements: 46 percent said the state is on the right track, while 37 percent said it's on the wrong track. Last year, 43 percent said right track and 40 percent said wrong track. Those partisan shifts are not unusual. Their assessments of the U.S. economy took a remarkable turn when Donald Trump entered the White House and Barack Obama left: In October 2016, 22 percent of Texas voters said the country was on the right track; in February 2017, 39 percent said so. In that earlier survey, 67 percent said the country was going in the wrong direction; after the change in power, 49 percent said so. “It’s hard to disentangle people’s lives and the increasing power of partisanship in their impressions,” said Jim Henson, co-director of the poll and director of the Texas Politics Project at the University of Texas at Austin. Republicans are happier than Democrats with the direction of the state. While 79 percent of Republicans said Texas is on the right track, 67 percent of Democrats said it’s on the wrong one. Independents were split 37 percent to 36 percent. A majority of Texas voters believe the country is doing better economically than it was a year ago, while only 22 percent believe it’s worse than it was. Another 23 percent said things are about the same. When it comes to the state economy, 43 percent said things are better, 34 percent said they’re they same and 16 percent said things have gotten worse over the past year. The economies of their own families is a slightly different situation: 37 percent of registered voters said things are better, 42 percent said they’re in the same place they were a year ago and 20 percent said they are worse off than they were a year ago.